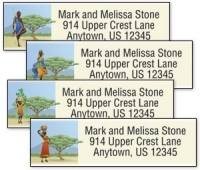 These address labels let you declare your pride in your cultural heritage each time you post a piece of personal correspondence. The collection has labels focused on black culture, European origins, Native American images, American heritage and simply the idea of international connectedness. The African-American choices are varied, from recognizable icons to silhouettes of people and examples of African art. Swatches of fabrics used in colorful saris decorate labels representing India's culture, while pictographs and traditional blanket designs are reminiscent of Native American heritage. Choose among many designs to proclaim your particular loyalties.